Many of our ‘Clean Energy liable clients’ are currently grappling with the complexities of tracking, managing and projecting for carbon units under the Clean Energy Act 2011. Historic emissions and energy systems have not typically been designed to account for carbon units, and some key regulations are yet to be established. Another piece of the puzzle has recently been added to the mix regarding the flexible price period – when carbon units will be auctioned by the Government and subsequently acquitted and/or traded on the secondary market. 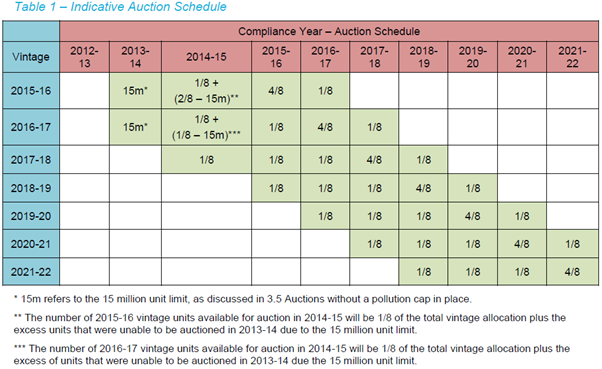 Auctions for permits under the flexible price period commence in 2013/14 (during the fixed price period). Auctions are to be held for vintages up to three years ahead (i.e. you can buy a 2016/17 permit in 2013/14). Auctions will follow a sequential ascending clock format (more on this below). Up to 4 auctions will be held each year approximately once per quarter. Until a cap on permit numbers is set in the 2014 budget statement (based on national abatement targets/trajectories) only 15M units will be auctioned per session (first two sessions). Unsold units will be carried forward to be auctioned in the next vintage period. The regulator will set a reserve price based on the price floor; this will be announced at least 14 days prior to the auction date. An electronic registry will be utilised, anyone with a registry account can participate in the auction. Minimum bid is for one unit while the maximum is 25% of the total number of units up for auction in the session. Proxy bids are allowed and settlement will be on a T + 3 basis (three days after transaction). Auction commences with a low starting price for units. Participants nominate the number of units they are willing to purchase at the starting price. If the aggregate demand is greater than supply, the auctioneer increases the unit price and the next round begins. Participants then adjust the number of units they are willing to purchase at the increased price. Participants may only reduce the number of units requested as the price increases. This continues until the aggregate demand is less than or equal to supply at which point participants of the final round are allocated their permits with the price equal to the previous round. Should there be ‘left-over’ permits i.e. in the final round the aggregate demand is less than supply, the Regulator may choose to exercise an intra-round bid. In this participants of the final round nominate a price they are willing to pay for the remaining units which is greater than that of the second-last round but less than the last round. Permits will be auctioned in sequence based on their vintage year. The Department have also released a tentative auction schedule as shown in the table below.